During the decade that U.S. District Court Judge James Redden rejected Pacific Northwest salmon-restoration plans, detractors quietly pushed the view that he had become an "activist" judge, blinded by personal opinions. Last week, a judge new to the case -- Michael H. Simon of Portland -- ruled on the U.S. government's latest Northwest salmon plan. If anything, Simon was even less impressed with arguments by NOAA Fisheries, the Army Corps of Engineers and the Bureau of Reclamation, which claim they are doing enough to stave off extinction for 13 iconic endangered and threatened salmon and steelhead runs. Fishing groups and conservation organizations say the government is contorting the plain meaning of the Endangered Species Act and the National Environmental Policy Act, doing all they can to avoid confronting the "original sin" of erecting four major dams across the Snake River, the major tributary of the Columbia. The agencies have undertaken valuable habitat-restoration projects here in the Columbia Basin and downriver -- basically trying to do all they can for salmon, short of major modifications to the hydro system. The Columbia is healthier thanks to the agencies, taxpayers and electric ratepayers. Restoring and protecting tidal wetlands, controlling pollution, dramatically increasing research and the level of monitoring of river conditions, controlling predation and other steps are all worthwhile. These efforts, sometimes coupled with favorable ocean conditions, have produced some decent salmon runs in recent years. But a run considered excellent in these times would have been viewed as disastrous in the pre-dam era. This year's predicted dismal coho returns demonstrate the fragility of any recovery in current salmon populations. 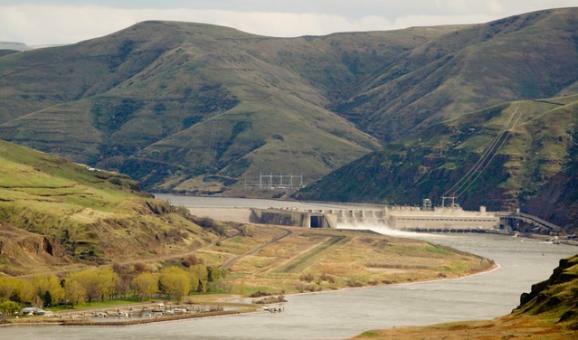 Taking out the Snake River dams -- or lesser actions like bypassing one or more, or drastically increasing the quantity of water spilled from them to mimic natural-flow conditions -- is politically difficult. Even environmentally minded Democratic politicians are loath to offend powerful economic interests lined up to defend dams. But the judge is right to suggest dam breaching as perhaps the only way to actually obey the clear mandates of the Endangered Species Act. Salmon face mounting existential challenges. The judge ruled the agencies' plan fails to acknowledge catastrophic impacts they may face from climate change. Officials are on thin ice legally when they assert salmon are "trending toward recovery" when actual salmon returns fail to show a sustainable recovery, the judge said. Simon's ruling -- though stopping short of imposing an action plan -- is one more in a long series of repudiations of half-measures. Federal agencies and Congress are fast-approaching a time of reckoning when it comes to ensuring salmon survival.